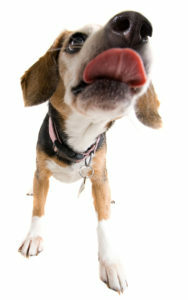 Dogs can eat peanut butter as long as it doesn’t contain xylitol or other artificial sweeteners. Peanut butter is a favorite among dogs. It’s a good source of nutrients and stuffed in a Kong, it can entertain a dog for hours. Make sure the brand you use don’t have extra salt, and that it’s not sugar free or “light” – sugar replacements such as xylitol can be lethal to dogs.